Grape varieties, unbeknownst to nearly everyone, have many secretive and entangled relationships. For most people, it is perfectly normal to think of grapevines as autonomous, unrelated plants. After all, we cannot see genes with our eyes, and we cannot even imagine the possible family trees showing the connections between what appear to be completely unrelated types. All is revealed in the extraordinary book by Jancis Robinson MW and co-authors Julia Harding MW and researcher José Vouillamoz entitled Wine Grapes – A complete guide to 1,368 vine varieties including their origins and flavours. To say this is a groundbreaking and sweeping survey is an understatement. It is as dazzling in its detail as The Oxford Companion to Wine. By exposing the secret relationships of grape varieties, Wine Grapes tells a story blending mystery and romance of a horticultural sort. A quick look at the complicated pictogram of varieties in Wine Grapes reveals three prolific “founder” varieties: Pinot, Gouais Blanc and Savagnin. Within each branch, there are several fascinating family trees or “pedigree diagrams,” as the authors call them. Considering the bonds that researchers using DNA fingerprinting have established, it is not unlike finding a long-lost relative on one of those ancestry websites. This is not guesswork: these are scientifically confirmed genetic linkages. It may be sad that some legends explaining the origins of grapes have been dispelled. For example, romantic stories suggested that Syrah was brought from Shiraz in Persia by early mariners or by Roman legions from Syracuse in Sicily. These possibilities seemed perfectly plausible – until bona-fide research revealed the true facts. This may hold a broader lesson at a time when popular myths seem to have more appeal than science-based knowledge. One counterintuitive relationship discovered a few years ago is that of Cabernet Sauvignon and other grapes commonly referred to as Bordeaux varieties – and all but one belong to the Savagnin branch. Even though it would have been silly to suggest something so improbable, Cabernet Sauvignon is the offspring of Cabernet Franc and Sauvignon Blanc. This crossing was not done at a nursery; it occurred spontaneously in Bordeaux centuries ago. Who would have believed that the world’s most famous red grape is linked genetically to a white variety and was named by borrowing one word from each of its parents? One of the discoveries reported in Wine Grapes is that Cab Franc also claims a direct genetic relationship with Merlot, by far the most planted grape type in the Bordeaux region. So the common blending of both Cabs with Merlot is a bit of a family affair, is it not? They have more in common than we could possibly have imagined. Let’s throw Carmenère into the same gene pool – it is also part of the family. This grape, once fairly common in Bordeaux, is now associated mainly with Chile (and, curiously, is also planted in China where it is named Cabernet Gernischt). One reason is that this variety did not take well to grafting onto resistant American rootstocks to combat phylloxera, the destructive aphid. Moreover, given the vine’s tendency to suffer from crop-reducing infertile flowers (coulure in French), Carmenère is better suited to Chile’s beneficent climate than to its cooler, wetter French homeland. So it is no surprise that Carmenère has virtually disappeared in France. The variety doesn’t even show up in the official statistics (compiled by France AgriMer). Wine Grapes tells us that a mere 50 acres remain in Bordeaux. Carmenère and many other French grapes found their way to Chile in the 1800s. For a very long time – in fact, until the 1990s – this variety was often confused with Merlot by grape growers. Today, there are about 17,000 acres of Carmenère in Chile as opposed to nearly 33,000 acres of Merlot. The confusion between the two plants was probably compounded by similarities in taste profiles. This brings us back to the genetic relationship and traits shared by the Bordeaux varieties. We should not really be surprised, in other words, that there are hints of the same aromatics in the Cabernets, Merlot and Carmenère. We now have some but not all of the missing links in the family tree of grape families. These are not the knuckle-dragging type, but forebears who played a key role in parenting grapes we know and admire. One of these grapes from the past is Magdeleine Noire des Charentes, which has been shown to be one half of the duo responsible for Merlot. The other half? Cabernet Franc. Magdeleine Noire also gets half the credit for Malbec (AKA Cot or Côt, still its preferred moniker in France). That means all the varieties associated with Bordeaux we have been discussing are in fact members of one big happy family: Cabernet Franc, Cabernet Sauvignon, Merlot, Carmenère, Malbec and Sauvignon Blanc. That leaves two varieties, putting aside a few very minor actors. Petit Verdot is a bit player in Bordeaux, which seems appropriate since it is an outlier in its genealogy. It is a distant cousin at best in that it is a member of the Gouais Blanc rather than Savagnin branch. The genetic origins of Semillon, an important green-skinned grape in Bordeaux, remain unproven. It may be related to Sauvignon Blanc, with which it enjoys a symbiotic relationship in both dry and sweet blends. 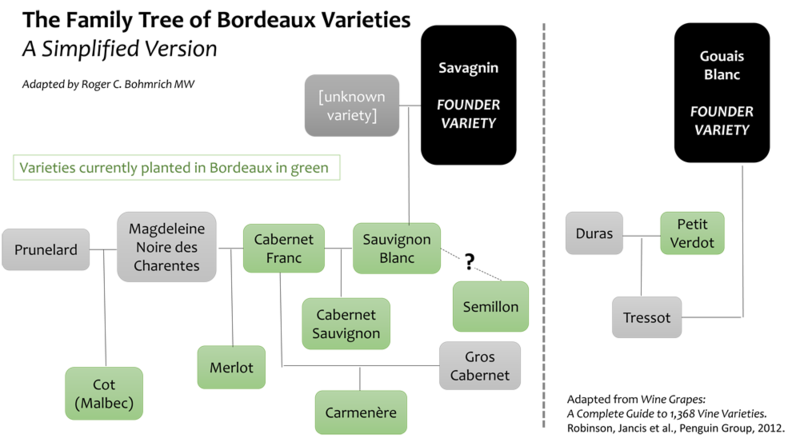 At this point, readers may want to refer to the simplified pictogram (below) to visualize the connections between the many Bordeaux varieties. Clearly, there are still holes (or should we call them missing leaves?) in the family trees, and some may never be filled because the unidentified grapes are extinct. One of the most fascinating of these pedigree diagrams is that of Syrah (the same variety as Shiraz, if there is confusion). There were so many legends about the origin of Syrah that we should have known they could not all be true. It turns out that the theory with perhaps the least romantic appeal is the one which has been proven largely accurate. There were numerous suppositions which were persuasive, and because no proof existed for hundreds of years, historians, writers and wine growers could entertain any of the possibilities. The dominant theories claimed the variety was brought from the Near East, perhaps Syria or Persia (hence the name Shiraz, an ancient Persian city). The vine could have been transported by Phocaeans, early Greeks from Asia Minor who established settlements along the Mediterranean coast, notably Massalia or today’s Marseille, in 600 BCE. Another variation of the “imported from the Near East” hypothesis suggested Syrah was first brought from Egypt to Sicily, and then taken from Syracuse by the Romans to Gaul, their colony, in perhaps the 3rd century CE. Those who wove these tales must have been disappointed when the actual birthplace of Syrah was discovered in the late 1990s. What researchers using DNA analysis confirmed was that Syrah is in fact a cross of two varieties found in southeastern France – Dureza and Mondeuse Blanche. So Syrah turns out to have been “born” in Europe. This is old news at this point – but there is much more to the story. While the initial identification of Syrah’s true parents caught the attention of the wine world, more recent research is now expanding the grape’s connections both up the family tree and outward along its branches by identifying siblings and possible great-grandparents. Yes, the skeletons are coming out of the closet! One of Syrah’s close relatives turns out to be another variety which falls into the Rhône group. The fact that the grape in question, Viognier, is in other respects so very different from Syrah may come as a shock. More recently, evidence has been found of genetic ties with another famous grape: Syrah, it seems, is part of the Pinot clan. Believe it or not, there is a family connection between the noble red grapes of the Rhône and Burgundy. To be clear, “Pinot” refers to a single variety which includes a long list of mutations, the most familiar of which are Pinot Noir, Pinot Blanc and Pinot Gris. How is this relevant to our story? Dureza – Syrah’s father – is related to a variety from Trentino, Italy called Teroldego. The ampelographer José Vouillamoz has established a genetic bond between Dureza and Teroldego and – you guessed it – Pinot. The story does not end here as there is so much more to tell about the secret relationships of grape varieties. Robinson, J. et al. Wine Grapes: A Complete Guide to 1,368 Vine Varieties, Including their Origins and Flavours. Penguin Group, 2012. Robinson, J. et al. The Oxford Companion to Wine, 4th edition. Oxford University Press, 2015.